Yadda, yadda. As if we hadn’t been chided, mere months ago, to remember that weather is not the same as climate (when parts of the world were coping with unusually large amounts of snow and lower-than-average temperatures). As if San Diego weren’t experiencing a remarkably cool summer. As if Bolivia weren’t struggling with millions of dead fish killed by a recent cold snap. As if cooler-than-normal temperatures hadn’t been blamed earlier this month for respiratory distress in one third of Chile’s urban population (apparently due to the cold itself as well as unhealthy sources of home-heating). I invite anyone to look at a front cover of a McLean’s [sic] from two summers ago. Oil will reach 200 a bbl. Your life will never be the same…bla..bla..bla. Well oil is 71 a bbl today. Earlier this year we were told by another cover story by this mag to expect Canada’s economy to totally tank with a double dip recession of biblical proportions. Still waiting. …Exactly how the end of cheap oil will change our lives is still far from clear. But change them it will, in profound and dramatic ways. …the real storm has just begun to gather. Should oil hit US$200 in the next few years, the world will be scarcely recognizable. …”The suburbs will turn to slums, salvage yards and ruins,” says the author…Kuntsler foresees apocalyptic fallout. It will become unfeasible for people to drive from the burbs to distant jobs, and as the petroleum refugees flee their McMansions, the sprawling cul-de-sacs will turn to ghost towns. As the global supply chains collapse, major importers like Wal-Mart will go out of business. …And don’t think for a moment that Canada…can escape unscathed. …as oil prices reach the stratosphere…people will find the era of cheap clothes and home electronics will screech to a halt. …there’s no avoiding the fact that the world has entered a whole new realm. If this reminds you of the over-the-top media coverage regarding the Y2K computer bug you aren’t alone. There is, as I’ve observed elsewhere, absolutely no accountability for media scaremongers. When overwrought predictions fail to transpire, everyone has already moved on. No one remembers the names of the journalists who wrote nonsense. No senior editor loses his or her job. The system contains no feedback mechanism whatsoever to rein in these sorts of excesses. The media and environmental groups share things in common. Both jostle for our attention. Both benefit financially when they over-dramatize (we buy magazines with exciting sounding covers and donate money to advocacy groups with urgent sounding campaigns). Both, therefore, portray issues of concern not as problems that will require ingenuity to solve but as crises that will decimate our lives. There’s a good reason why “people don’t wake up until things are flying apart.” That’s because the professional doomsayers are nearly always dead frakking wrong. 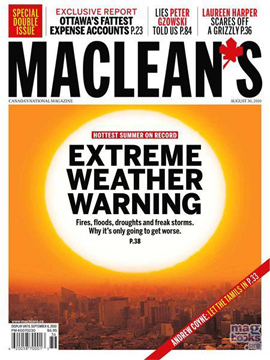 This entry was posted on August 27, 2010 by Donna Laframboise in media, predictions that failed and tagged Macleans magazine, media, predictions that failed.